The Atlas-I-Z8 System-on-a-Module (SoM) is an advanced high performance heterogeneous computing architecture on a module smaller than a credit card. The Atlas-I-Z8 is designed for compute-intensive production applications that are sensitive to power, reliability, size, and cost. 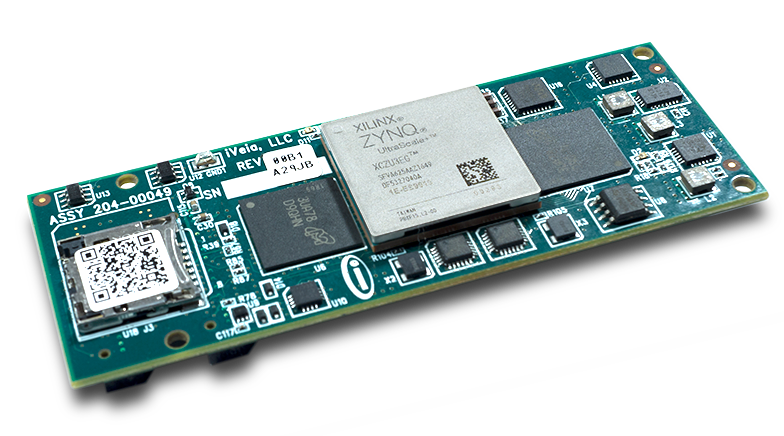 Featuring the 16nm Zynq UltraScale+ Multi-Programmable System-on-a-Chip, the Atlas-I-Z8 combines a quad-core 64-bit ARM CPU architecture with abundant programmable logic resources, including over 1,000 DSP blocks. Incredibly, an additional 32-bit DDR4 memory bank dedicated to the programmable logic has been added to the design for processing intensive applications…and all with no buried or blind vias. As with all of iVeia’s Atlas SoMs, the Atlas-I-Z8 is designed and built for reliable operation in harsh environments and is fully compatible with all Atlas-compliant baseboards. The flexible Atlas architecture allows for system scalability in performance, I/O, size, and power, and provides a migration path between differing technologies and future Atlas modules. The Atlas-I-Z8 supports iVeia’s Velocity-HF™ heterogeneous framework that accelerates development time by up to 50% or more and provides an application portability layer between different modules and processor technologies. Also offered are iVeia’s RTL-optimized libraries for signal processing (Velocity-SDR™) and video processing (Velocity-VIP™). © 2019 iVeia. All Rights Reserved.